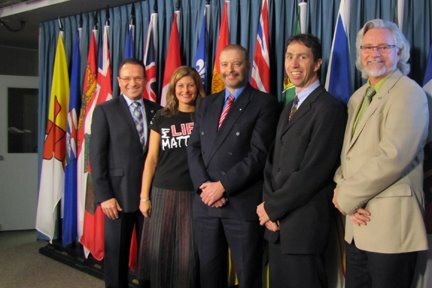 OTTAWA, ON (February 15th, 2012) — Today the House of Commons passed Bill C300, an Act respecting a Federal Framework for Suicide Prevention, at Second Reading, by a vote of 285 in favour, 3 opposed. 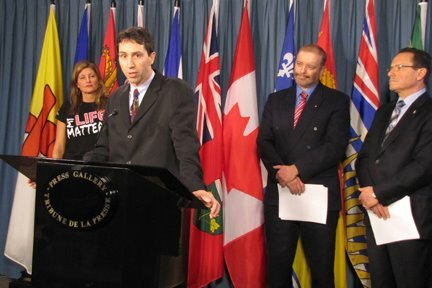 Harold Albrecht, Member of Parliament for Kitchener-Conestoga tabled Bill C300 on September 29th 2011. Bill C300 will require the federal government to: recognize suicide as a public health issue, provide guidelines to improve public awareness of suicide, disseminate information about suicide and suicide prevention, make available to the public statistics about suicide and related risk factors, promote collaboration and knowledge exchange across Canada, define best practices for the prevention of suicide, promote the use of evidence-based practices for the prevention of suicide; and report back to Parliament at defined intervals regarding its progress. At a press conference held earlier in the day, Harold was joined by suicide prevention advocates. As both a widow to suicide and a suicide prevention advocate this announcement gives me great hope for the future! Thank You so much for your hard work and determination in breaking the stigma surrounding suicide!! From “Journey to Hope” in Moose Jaw, we send our heartfelt thanks for your hard work in breaking the silence and stigma that so many live with. You are raising hope and that is priceless work. Thank you so much for your dedication to bringing this serious issue forward to the House of Commons and to the public. I appreciate your dedication!